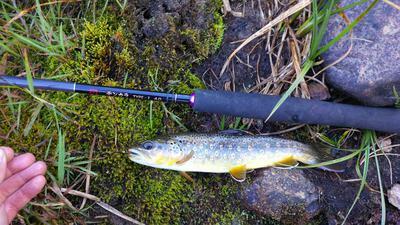 I had the chance to travel to Colorado in late September for business so I couldn't resist adding on an extra few days in order test the local waters. 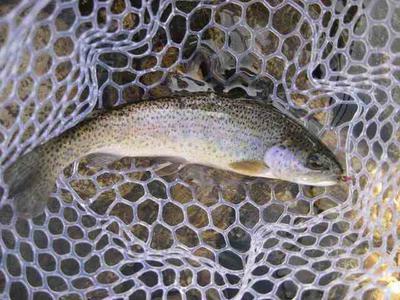 After weighting the available time, the desire to avoid crowds and evaluating the probability of catching trout, including the fabled cutthroat, I decided to organize my fishing efforts around the Cache la Poudre watershed. I had intended to fish the smaller tributaries but the staff of St-Peter's fly shop in Fort Collins (name dropping on purpose, the service was excellent) told me that water levels were low and that I probably wouldn't have much luck. In any case as soon as I entered the foothills, probably less than 20 minutes from Fort Collins, I couldn't resist stopping at one of the numerous pull offs and unpacking my tenkara gear. Now, as most of you reading this will know, the interweb is full of blog-vlogs of tenkara fishermen casually pulling out dozens and dozens of trout as if they were pulling carrots out of a garden. For me, mostly fishing in southern Québec and upstate New York, catching half a dozen fish (other than ubiquitous chub) is a good day. So needless to say I was pretty happy landing two fat rainbows within 15 minutes of fishing on the Cache la Poudre. 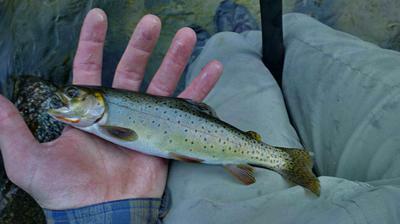 I continued hop-scotching along the Poudre Canyon Rd, never being crowded, or even being near other fishermen. It's a perfect tourist stretch of river - easily accessible, and full of fish. If it wasn't for the road traffic it would be ideal. 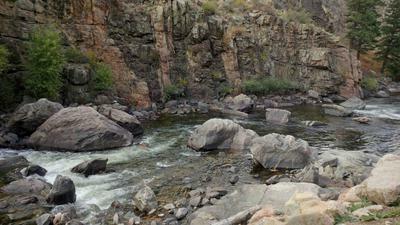 After a few hours I had many fish and I hadn't even arrived to Poudre Park. I packed up and headed deeper into the mountains to find a camping spot for the evening. I had planned to hike into Sheep Creek the next morning but the access road was blocked due to logging operations so instead I fished the south fork of C la P along CR63. I was on the water by 7 am and had half a dozen browns an hour later. The catch rate slowed down by 10am so I cooked up a huge meal and contemplated my next move. After some inspiration from the fine Colorado tobacco I thought I would head higher up the mountains to Twin Lake Reservoir. I geared up but it was perhaps 1pm when I started hiking along the Stormy Peaks Trail. The fork to the reservoir arrived much too quickly so I decided to just keep going and cross over the pass into the Big Thompson River. I crossed the into Comanche Peaks Wilderness and then into RMNP and finally to Stormy Peaks Pass at 11500 ft by around 5pm. I started back down towards the Big Thompson but realized that the sun sets around 7pm and I didn't want to return in the dark. So I raced back down, ran into a heard of elk and several grouse, and even managed to catch a few more browns in Fall Creek before dark. The next day started on the South Fork of C la P, (early start, several browns) before moving to the main branch (several rainbows, a few browns) and the driving to the Big South trailhead and hiking a few miles to set up camp and catch a few browns, two brookies and one Cutthroat. A grand slam for the day! This last bit of river was by far my favourite. It's steeper, wilder and narrower so it's more adventurous to travel along. More importantly the road doesn't follow the river after Big South so you get a real sense of wilderness fishing. I fished early the next day, with typical early morning success (browns, brooks and cutts) before heading to Denver for work. Flies: I don't use a large array of flies but almost everything I used worked. Kebari, Killer bugs, Copper Johns and Pheasant tail nymphs were standouts. Teeny nymphs under performed. Rods - I own three tenkara rods (Oni type I, Rhodo and Nissin 450ZX medium) and I've only ever fished with these so I'm not a specialist by any means. I use my Oni type I almost exclusively and I really like it. When space gets tight I break out the Rhodo and it performs well but it's not a pleasant experience like the Oni. The 450ZX is a pain to fish, heavy and cumbersome. The Oni is quite soft and on one occasion I had difficulty controlling a trout in heavy current and I eventually lost it but this may be due more to inexperience than the fault of the rod. But for the type of river and the size of fish I catch (<16in) the Oni is great. The rest of the gear I use is generic and inconsequential. Thanks for reading, please share your stories. Reading your story really makes me envious that I don't live near any streams. Here in the desert southwest, I have to drive at least 2 hours to get to somewhere that I can fish for trout. Your stories are good inspiration. Really enjoyed that trip report - A good vicarious fishing experience, and I've filed the rod evaluations in the back of my mind for future reference. A couple years ago, the Poudre, and most of the middle and north Front Range streams flooded, and were badly scoured. I just read in the Denver Pest the other day that they've earmarked funds for restoring trout habitat in the Poudre, with some work also restoring wetlands. Pre-flood, the estimate was 1000 trout per mile, and now it's down to around 100. Gorgeous river, though! I appreciate your attention to detail on the locations. Getting to know the front range better is my priority next year. Frank, I feel your pain. I also often have to travel 2 hrs for some decent fishing. Living in Western U.S. is a trout fisherman's dream. Steve, I have no frame of reference but I can't imagine what 1000 trout per mile would be like considering my success on the Poudre with 100 trout per mile. Alan, I was impressed with front range fishing but I assume it's even better as one travels deeper into the Rockies. I wouldn't give away any "secret spots" on this type of report but everything I fished is pretty common knowledge. If a tourist like myself can figure it out using google map I assume the locals know about it. Like everywhere else I've fished the density of fisherman is inversely proportional to the effort it takes to get to fishing hole. More than 45 minutes of hiking eliminates a lot of people. Why are western rivers so much better than out east? Are the rivers better managed? Cleaner? Is it the lesser population density and greater number of rivers out west that reduces fishing pressure? Great report Stephen. Thank you. I've not fished an Oni Type 1, but I've lately grown to really appreciate softer rods. After fishing my new Zerosum Oni 450 for awhile my Suntech Fieldmaster 39 felt stiff as a board. I've just ordered a new softer 39 (Suntech Kurenai HM39R). I'm happy your trip went so well. Happy fishing indeed. So the variety is not lacking at all. I think Colorado is a bit hammered though I always liked to fish it. I agree with you in that ONI I, I also really like my ZX's and they handle a lot bigger fish so therefore they are heavier, not really a creek rod. Now the ONI 450, WOW! Hey, nice report here. As someone who also recently visited Colorado and usually fishes upstate New York, I share your sentiments! The numbers of fish per mile seem much higher in CO than back home. The only difference? Brookies are an invasive species. I find that hilarious. I too sampled the fine Colorado Tobacco products and I know exactly what you mean ;) They certainly provide tons of inspiration when in the mountains! Thanks for the write up, glad you had a blast and caught a bunch of fish!